The Amazon is teeming with wildlife. 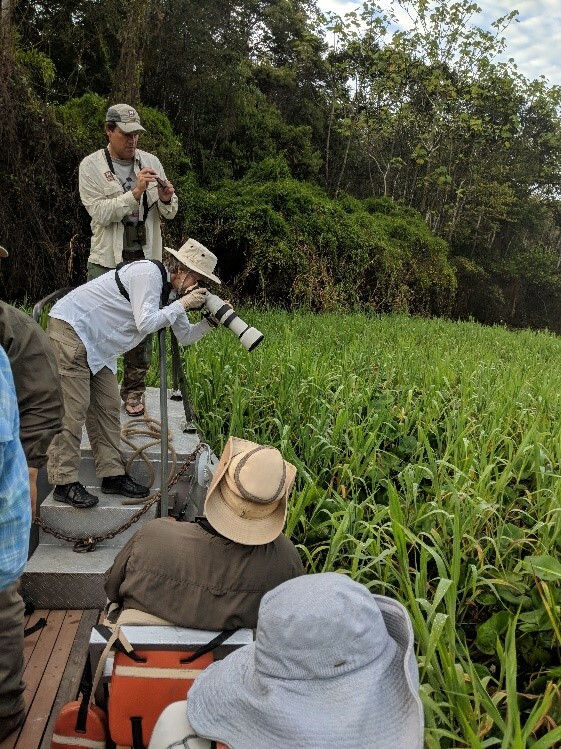 While traveling with Natural Habitat Adventures, I had the chance to see so many charismatic species, including pink and gray river dolphins, seemingly endless bird species like kingfishers and macaws, squirrel and woolly monkeys, three-toed AND two-toed sloths, and not to mention caiman. While seeing all those in-person is incredible, capturing them on camera is tougher than the professionals make it look. Due to my amateur photography skills and an unexpected broken zoom lens, I found myself leaning in and taking pictures of Amazon wildlife close-up, and things that didn’t move so much! Turns out, I found a bit of the hidden Amazon. 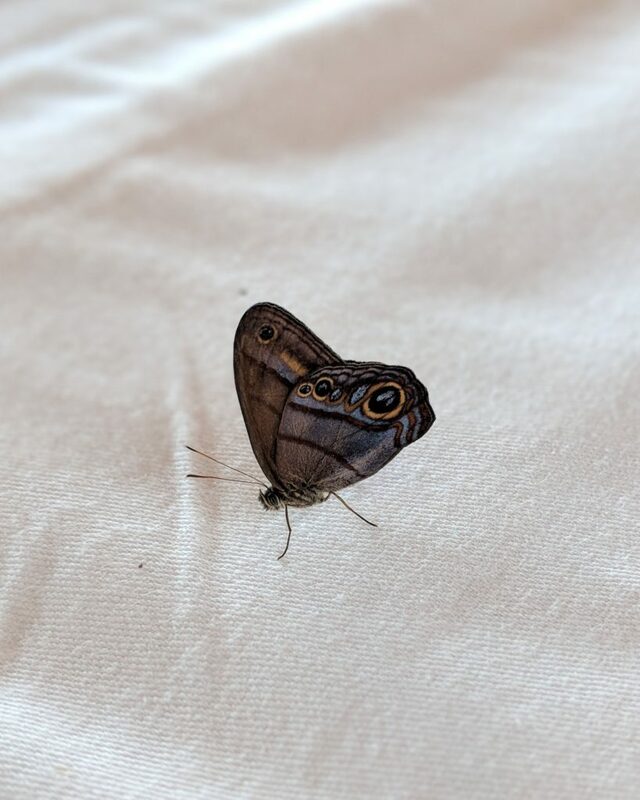 While others were drinking pisco sours, I caught the owl butterfly above relaxing on the couch on the top deck of our river cruise boat. It feels like every possible ecological niche is filled in the Amazon. Everything is food for something else, including logs and living trees! The Amazon forest is a multi-layered ecosystem. 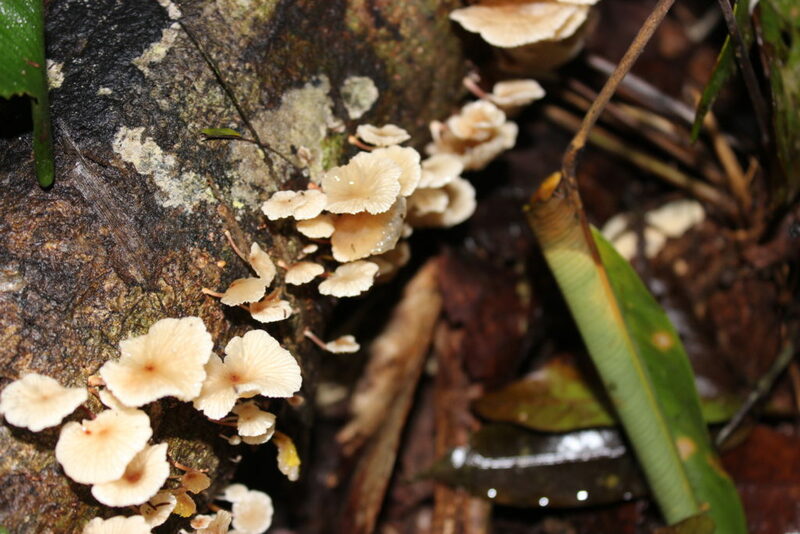 On every tree, vines and lichens create miniature forests. Giraffe frog, also known as the clown tree frog. A traveler getting a glimpse of the hidden Amazon. My fellow travelers had some incredible gadgets to photograph wildlife in Peru, but even with the best gear you still have to lean in to get a good look at the really tiny or camouflaged species. 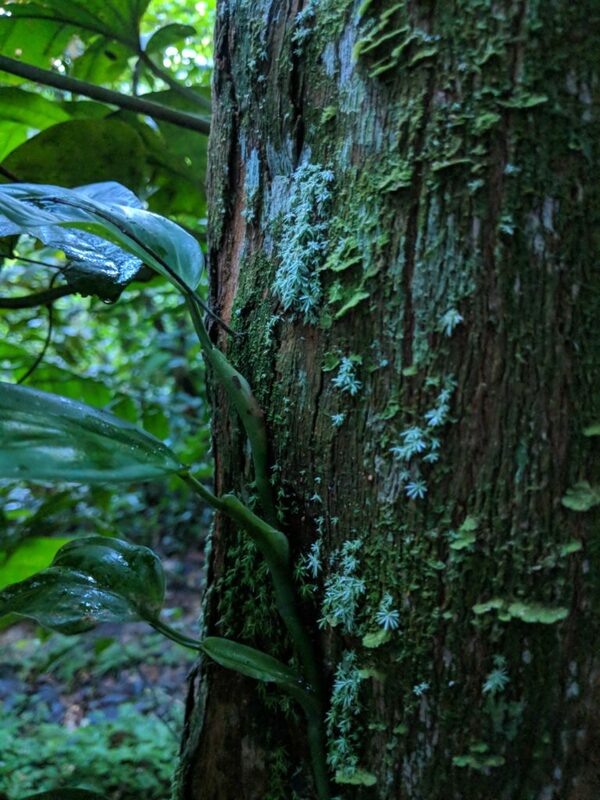 In the first photo of the slideshow above, we walked by a bush in a village near Porto Miguel, and one of guides pointed out the giraffe frog in the leaves. 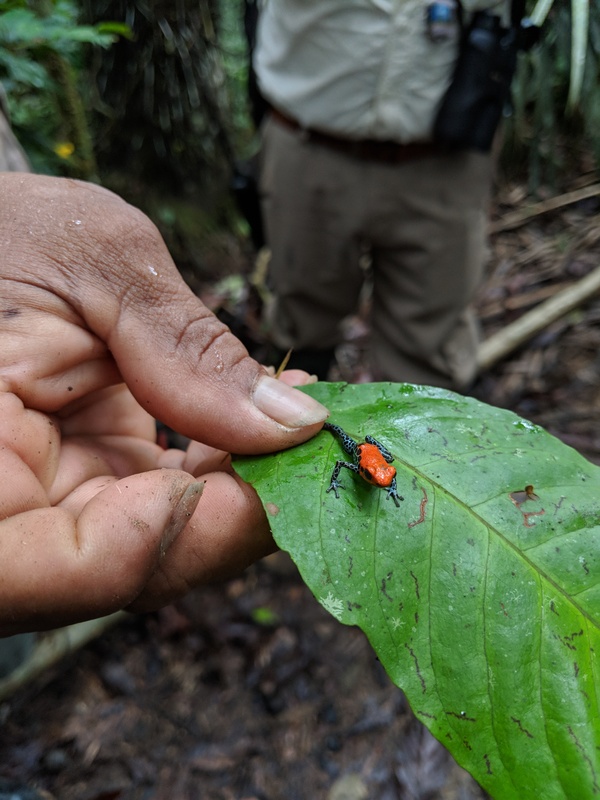 While we were walking along a trail in a private reserve, a local guide with completely DEET-free hands showed us a tiny poison dart frog. 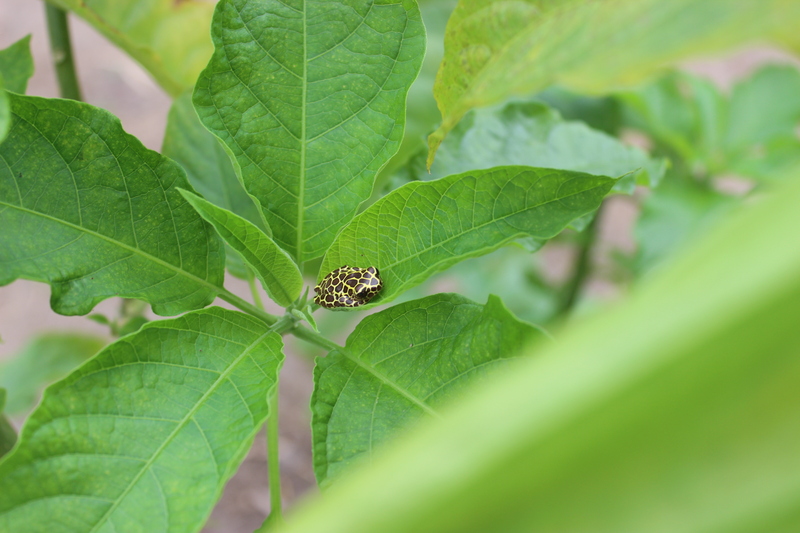 1) Bugs, bugs, and more bugs! 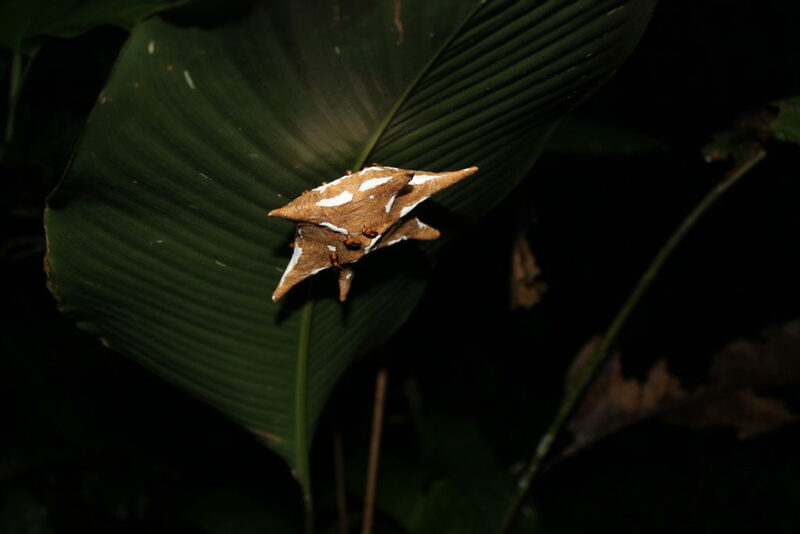 The Peruvian Amazon is full of fascinating bugs. I saw so many, that I didn’t have time to ask the guides the names of every species. Some of the bugs make themselves known – like the parades of leaf cutter ants and the damselflies that land on you. Others like the lichen mantis and the paper wasps hide in the miniature forests on the trees or on the underside of leaves. One thing is certain, you won’t notice any of them if you don’t pause to look. Every time I bent over to get a closer look, another traveler would pop in behind and ask, “what have you found?” It was always something spectacular. I count the broken zoom lens as one of the luckiest circumstances of my trip. Otherwise, I never would have discovered so much of the hidden Amazon.